Founded on 28 January 1992, BRASMACOL operates in the segment of MDF furniture components, addressing the needs of furniture industries in Brazil and abroad. Always open to growth and innovation, BRASMACOL presently has Brazil's largest structure in its category, fulfilling orders from industries throughout the country, mainly due to the seriousness with which it operates and the excellent product it offers. 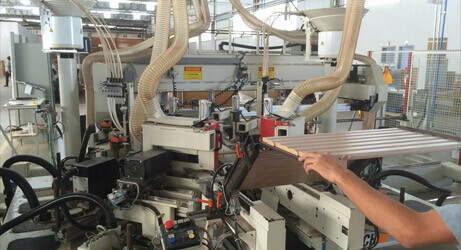 BRASMACOL has been working in the segment of MDF components for furniture, meeting the needs of the furniture industries in Brazil and abroad. Based on quality, high technology, professionalism, competence and updating, it develops all its production focused on the satisfaction of its clients and employees. BRASMACOL has a modern industrial park with updated machines that allow the complete development of moldings, doors, and drawers. We have at our disposal in-company tooling, which allows agility and the customization of profiles for boards machining. We cover the MDF with FX and FF papers, PET or PVC, wherein it is all developed according to the customers project. We have technology for custom cutting, drilling, dowel application, top finishing, and assembly of doors and frames. Brasmacol, in its quest for constant improvement, invested in its processes development and on meeting its customers requirements through ISO 9001 certification, achieved in 2003. Since then, beyond meeting normative requirements, Brasmacol has improved its processes to ensure Stakeholder satisfaction. Used as a management tool and aiming at the continuous improvement of its processes, the "Brasmacol Quality System" provides significant advances throughout the organization and, consequently, the improvement in relations with customers, through the fulfillment of their requirements. On 28 January 1992, Giovani Alberto Colognese and Elmar Ivan Kerschner founded Brasmacol, at first a company with its production focused in providing pre-cuts for furniture industries throughout Brazil. We find at Brasmacol the openness to new ideas, wherein two years after its foundation, in 1994, it began to direct its production towards the manufacturing of drawers and bed frames, making use of Pinus as raw material. The company, since the beginning, has been concerned in selecting certified suppliers and only using reforestation wood. A few years later, in 2003, Brasmacol had its processes certified by ISO 9001:2000, through the work effort from everyone and the concern with the quality of the services provided to its customers. In 2004, the line of Pinus Drawers was deactivated at the same time when the new line of MDF Moldings was deployed, thus changing and expanding the layout of the entire factory's floor plan. At the same time that it was growing, Brasmacol also began to stand out in the market and to become nationally known. We participated in the first fair of the segment in 2006, in Arapongas, and from then on, we have visited and exposed regularly at fairs in Brazil and in countries like Germany, Argentina, and the United States. Since then, many changes have been made to the factory’s floor plan and to the structure of the entire factory: in June 2010, the installations adjacent to Brasmacol were purchased, giving rise to improvements and expansion projects of the industrial park. These installations are presently the unit where glass is currently processed, with it being another production line added to the products from Brasmacol. In 2013, the construction of the drawer production unit started and in 2015 (already with the drawer lines relocated) the restructuring of the door and profile lines unit started, location where we find the PPC and the Development, Tooling, Maintenance and Warehousing sectors. In addition to the reformulation of the layout, a lot has changed in relation to automation and the state-of-the-art machinery acquired and installed in this process, inclusively for glass processing. BRASMACOL presently has Brazil's largest structure in its category, fulfilling orders from industries throughout the country, mainly due to the seriousness with which it operates and the excellent product it offers. As a responsible company, we are always attentive to the needs of an increasingly demanding market, without disregarding the environment and all that it offers us, at the same time in which we provide decent jobs and develop, in addition to the raw material, quality products. This goes beyond Brasmacol’s mission - it is the obligation of a company committed with the future and life. This is the reason why there are so many people that makes us feel proud for having them work with us. Some of them long enough to blend their own history with that of Brasmacol. Many years of hard work, of ups and downs, but full of achievements. For all the hardships we overcame, for the unconditional respect for all members of this company, customers, suppliers and partners, and mainly for the always-present honesty and consideration, we wish and celebrate a happy birthday together!